There are few things in life that are predictable. Death, taxes, bad weather at weekends, a ladder in your tights when you’re going out to dinner, and the quality of Grub Street books. They have developed the knack of selecting the most appealing of volumes to republish. 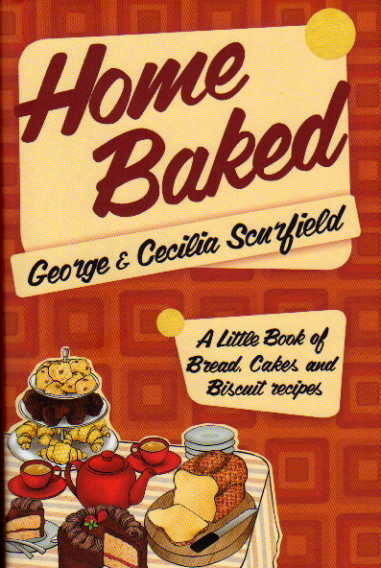 Home Baked by George and Cecilia Scurfield is another in that list. Home Baked was originally published in 1956, and Home-Made Cakes and Biscuits in 1964. Here we have both books combined. Yes, they are a good few years old but read a few recipes and you’ll understand why the great Elizabeth David thought so highly of these books. The baked goods are international and traditional and will be as welcome today as they were 50 years ago. George and Cecilia were not born bakers but were driven to bread baking. They found commercially produced loaves to be lacking in both taste and texture. Perhaps the quality of shop-bought bread has improved somewhat over the past half century but there is still nothing to beat your own bread. It’s a myth (probably promoted by bread manufacturers) that it takes hours of your time to make. Nonsense! A bit of mixing, 10 minutes of therapeutic kneading, 5 minutes of artistic shaping and half an hour of lustful longing as you wait for your masterpiece to cool. 20 minutes of your effort and you have something of which to be proud. There is everything in the bread-making chapter that a novice baker might need. Oven temperatures, shaping and glazing are all covered. There are basic bread recipes and then an array of English Tea Breads. These are the bedrock of old-fashioned teatime along with Tea Cakes such as the celebrated Sally Lunn. My vote goes, however, to the Malt Bread. This is a truly exceptional and moist confection which lists black treacle and malt extract amongst its ingredients, and it keeps well…if you can resist eating the whole loaf in one sitting. The Coffee Breads from Abroad collection offers amongst others, Croissants, Danish Pastry, Brioche, Streusel Cake, and Swedish Coffee Bread (contains no coffee, you eat it with a cup of coffee). German Apple Cake (Apfelkuchen) is well worth trying: you are unlikely to find this in shops unless you are lucky enough to live near a continental or Jewish bakery. This is a sweet cross between a bread and a cake. But there is more! Next the Cakes and Biscuits section tempts us with more delights which would constitute a fine teatime spread. There are sponge cakes, fruit cakes, Christmas cakes and chocolate cakes, and an assortment of pastries. My choice for a traditional selection would be Walnut Cake and Gingerbread (sticky and delicious). Biscuits (or cookies for my American readers) are also an essential at teatime…or anytime. Shortbread is so simple to make and the joy of paying a fraction of the price of shop-bought will add to the experience. Orange Jumbles are tangy little treats which have a taste of summer and I think they go wonderfully well with a glass of something sparkling. Home Baked is simple delight and temptation. Takes me back to Sunday tea, Lyon’s Corner House and even cooking lessons with Mrs. Kenerly (who said I would never make a cook!). I’ll use these recipes often and you can pay no higher compliment to a cookbook.